Hroggar is a Nord lumberjack currently enthralled by Alva, a vampire. Hroggar lives in Alva's house and will turn hostile should you enter while he's there. As you will learn from the townsfolk, Hroggar's wife and daughter recently perished when their house caught fire. Hroggar moved in with Alva the next day, raising suspicions. You will be tasked by Jarl Idgrod Ravencrone to investigate the matter during the related quest. Should Hroggar survive the quest, he will attempt to return to a normal life. He will pay you to bring him lumber. He wears a set of farm clothes and a pair of boots. 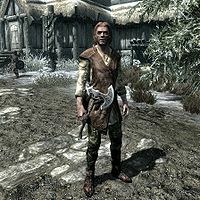 He is equipped with a steel war axe, and carries a key to Alva's house, as well as a selection of common loot and gold. If you try to speak to him, he will dismiss you by saying, "I... I'm not one for talk. Try to keep to myself." or "I just try and do my job, and not to think about what's happened. Try to find what happiness I can." At other times, he has some advice for you: "Ignore the talk of spirits and creatures and such. It's just superstition." or "There's enough real troubles in the world without making new ones up." If you have not discovered Alva's true intentions during the quest Laid to Rest, Hroggar will also tell you, "Alva's been good to me ever since... well, since the fire." Once you have completed the quest, he will thank you for your deeds: "Thank you for saving me from Alva. I was completely under her evil spell. I'll never forgive myself for what happened to Helgi and my wife." If Hroggar should happen to die before Laid to Rest begins, this will not prevent the quest from triggering and proceeding as normal. After you've killed Alva, Hroggar's disposition towards you gets a hit (-2), even though he will thank you for saving him from Alva. He will also continue to use some lines of dialogue from when he was her thrall. This page was last modified on 8 January 2018, at 21:19.